Okay. Well here I am ready to start reviewing the four segments of my journey from Beijing to Moscow, around 8000 kilometres away, via Mongolia. 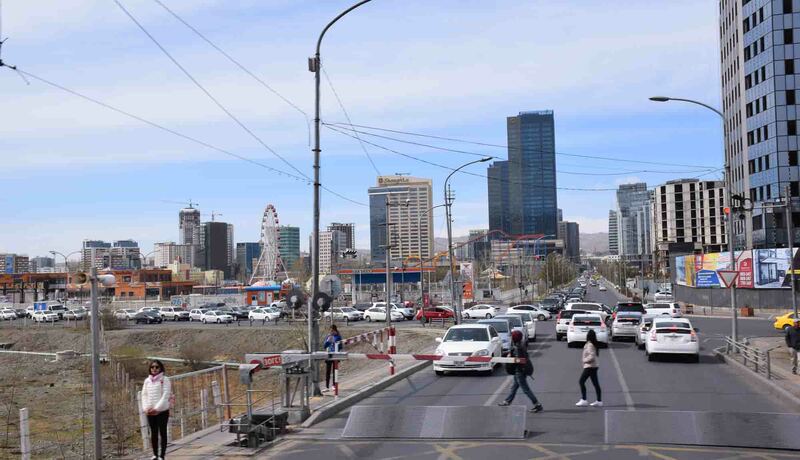 The trip to the Mongolian capital of Ulan Bataar was 1426 kilometres, crossing the border at Erlian (China) passing through Jinignan, Zhurihe and Dzamynude and other towns that perhaps I will never know the correct pronunciation of. 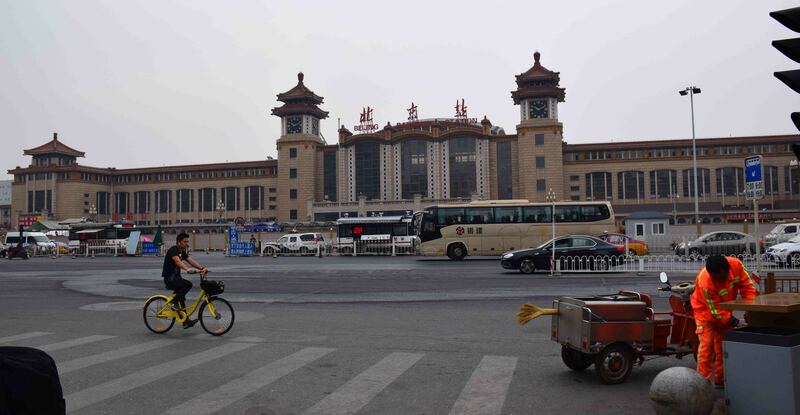 Beijing Train Station with the K3 at the ready. 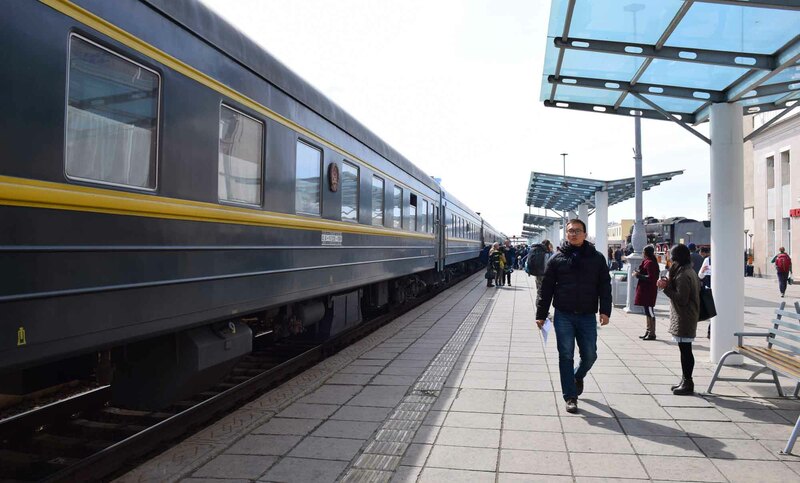 This train, K3, is the official ‘Trans-Mongolian’ train. I would be on the same train again from Irkutsk to Ekaterinburg. Otherwise I would be on ‘local’ trains for the other two legs. 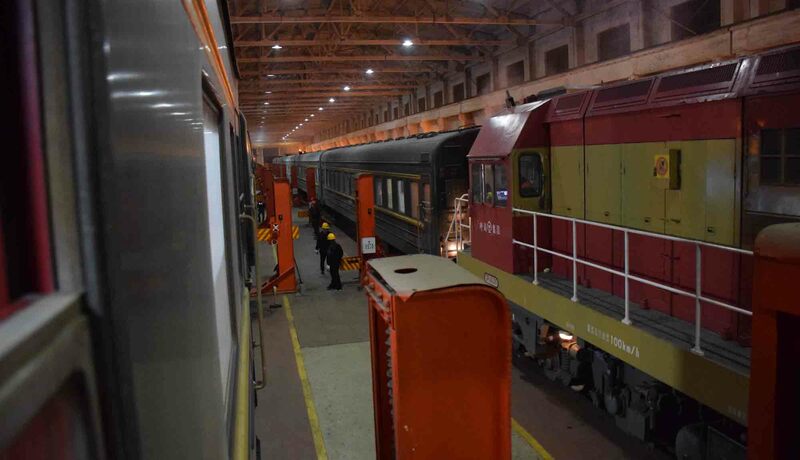 The K3 is a weekly Chinese train which makes the six-night run to Moscow. It was interesting to see how it all worked. 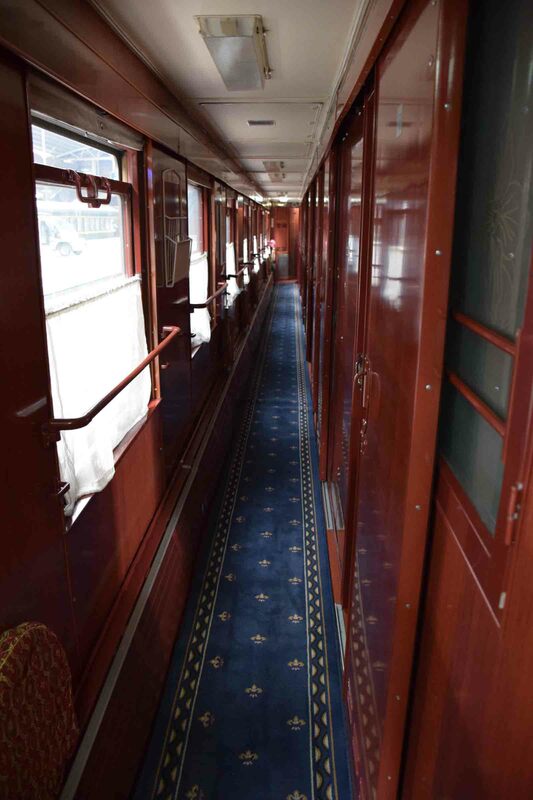 It has the same guards on each carriage, I believe, for the entire trip (so the Chinese crew) as the carriages are Chinese, but it does pick up additional carriages in Russia which are staff by Russians. 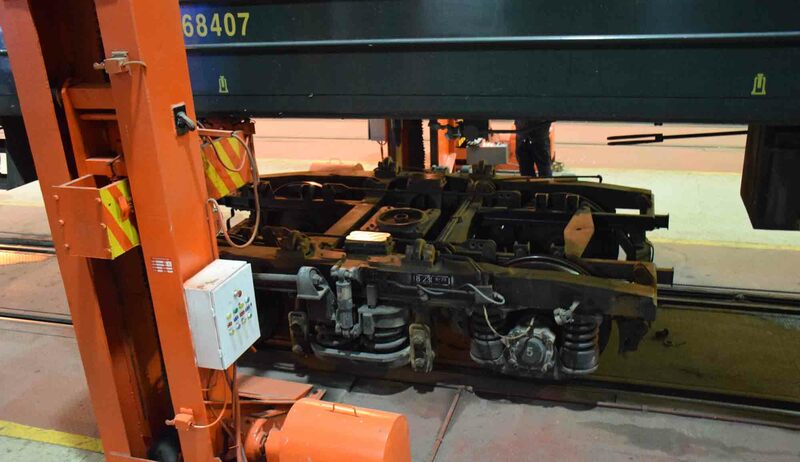 Perhaps the most interesting part of this journey is the changing of the bogeys, the wheels that go underneath the carriages. 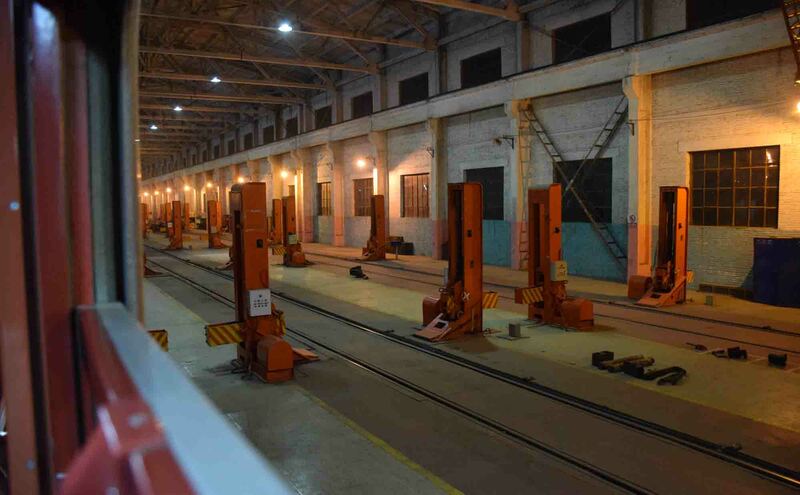 Russia and Mongolia have a slightly wider gauge than China does, and so at the Mongolian border the carriages are lifted from the tracks and new bogeys are wheeled in. With the passengers on board. The departure time was 11.22am and we were on time when we left Beijing. 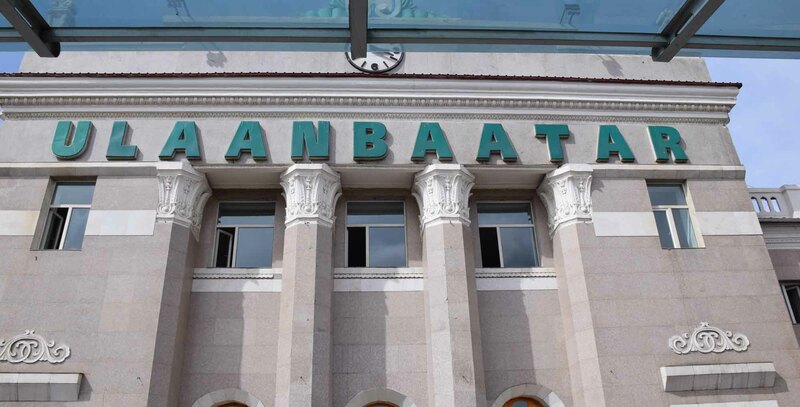 We were due in at Ulan Bataar the following day at 14.35, there is no time difference from China to Mongolia. 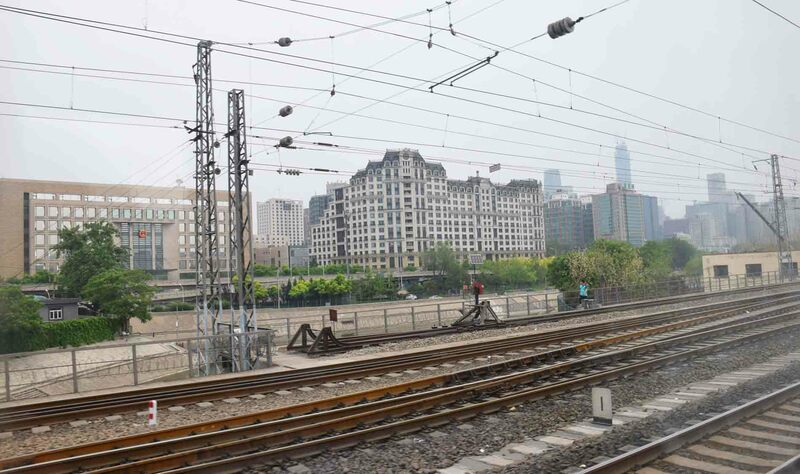 This train leaves every Wednesday from Beijing. I arrived a little over an hour before departure. To get into the station there is a fair bit of security and it took ten minutes. 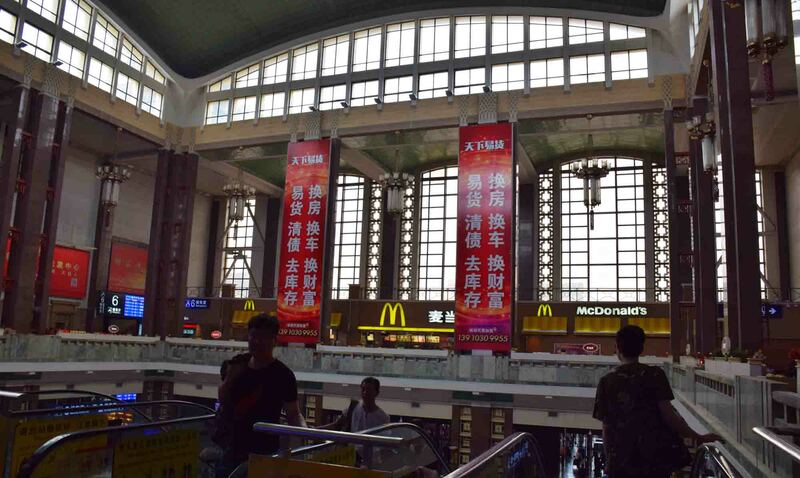 There was a surprising amount of shops in the station, and then there are various waiting rooms. The one for this train had a fair mix of foreigners with locals. I found many of the foreigners were doing the whole journey in one hit which surprised me. I had broken it into four legs and wished I’d had more time to break it down further. I booked the ticket back in March via China Highlights. It was a good choice, the only negative thing I can really say is that they won’t email to a gmail email address. They sent the ticket to my hotel a few days before I arrived via courier so it was waiting for me when I got there. There were at least 20 carriages on the train, pulled by a diesel locomotive. I had a second class birth, which cost a little over $330 US, I think that included the agent’s fee which was $50. 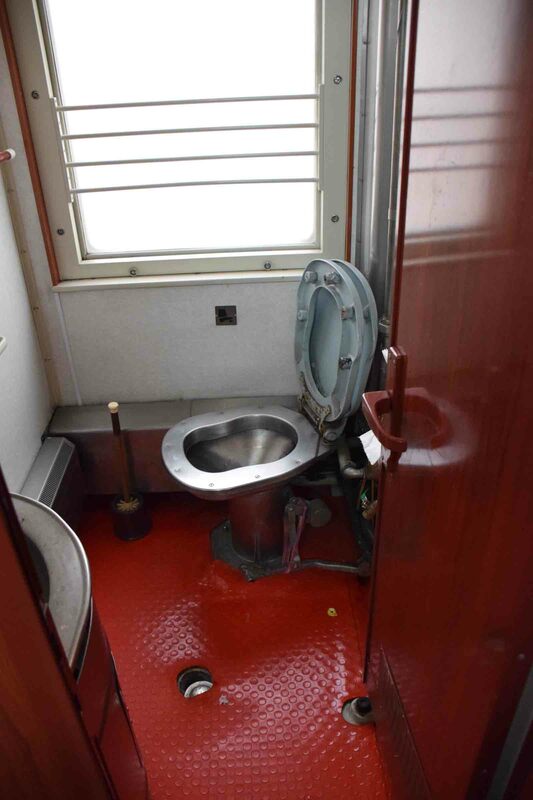 It was the most expensive of all the tickets I bought, but I was in a two-berth cabin that even had a shower adjoining it. Not that anyone ever used it. The toilet was okay, and kept pretty clean, not nearly the nightmare I might have imagined. The conductor of the cabin moved me and my roommate into a cabin at the other end of the carriage and swapped us around, and I ended up on top, which I wasn’t happy about but I didn’t want to annoy my roommate – it wasn’t his fault. I would be on the bottom for the other three trips anyway. The table was a decent size, good for writing and using my tablet. The seat was hard though, and very uncomfortable. The carriage didn’t look very modern, a little worn. 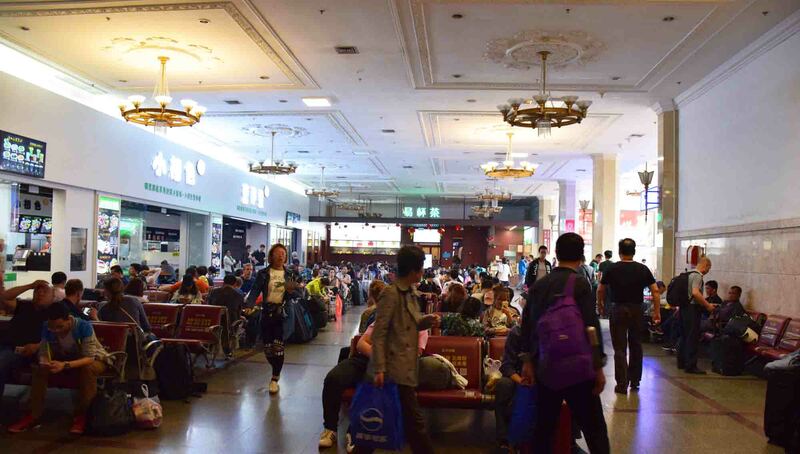 The Chinese trains have the reputation of being poorer than the Russian trains, and the Trans-Mongolian has the reputation of being the poorest of the big three – Trans-Siberian, Trans-Manchurian and Trans-Mongolian. Still, it was decent enough I thought. Shortly after leaving Beijing we were handed out unexpected vouchers for meals in the restaurant carriage, which I think was the next one along. 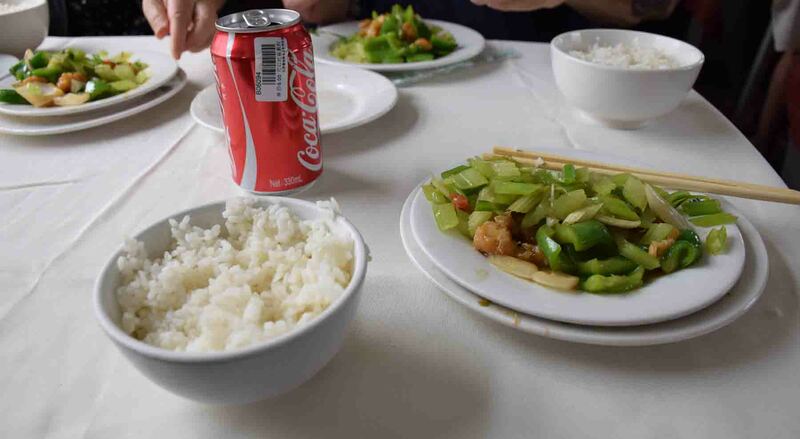 I had expected we’d need to buy meals, but in China the meals were free. They were basic, rice, vegies and a little bit of pork but I thought tasty enough and you could buy drinks to go with them. 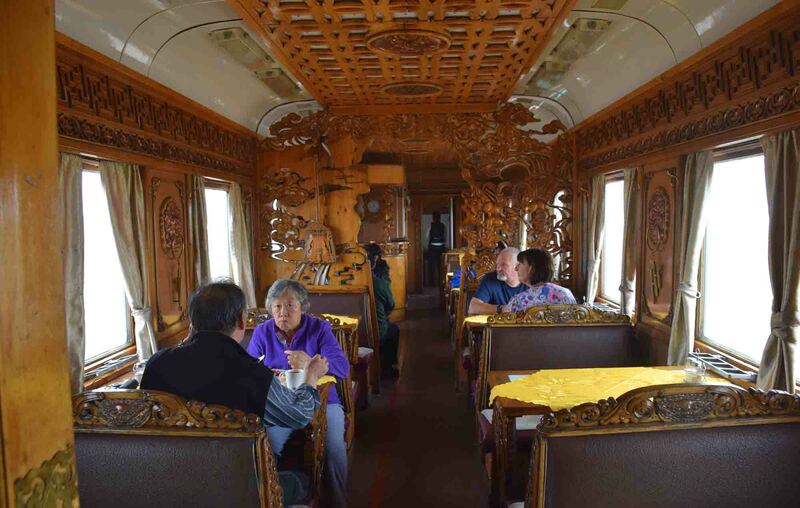 I had to get in quick because the dining carriage is not so big and before you know it, there was a long line up waiting to get their meal and take their seats. 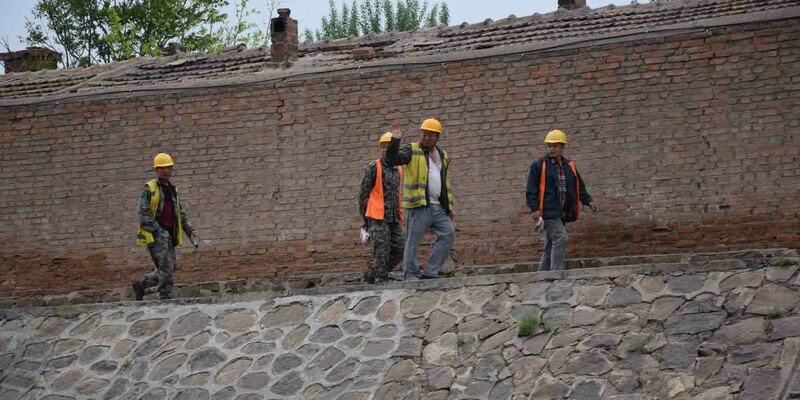 Workmen wave to the train. The view was very pretty I thought for this leg. 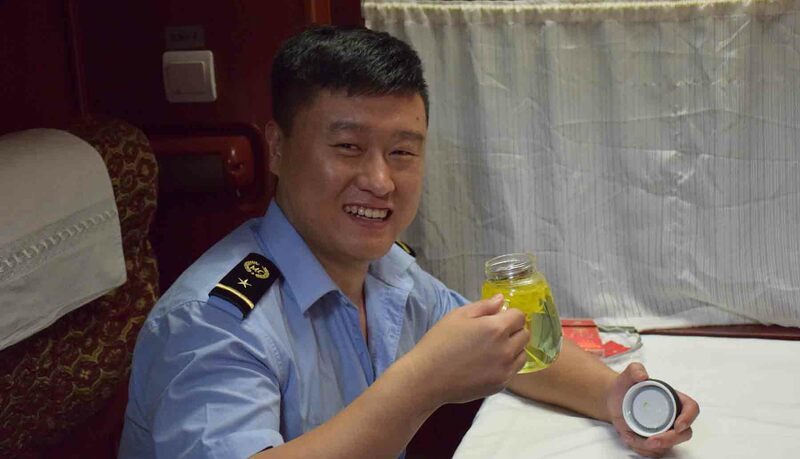 It seems it doesn’t take that long to get out of Beijing and before you know it you are going over rivers, seeing mountains, and there are also a lot of tunnels. It certainly wins for the most tunnels of any leg! Before I knew it, it was night! The problem was that at 11pm or so we got to the border. I don’t really sleep when the train is stationary, and I didn’t know whether to try or not, because you don’t know when an official will tap at your door, or even if we needed to get off the train. 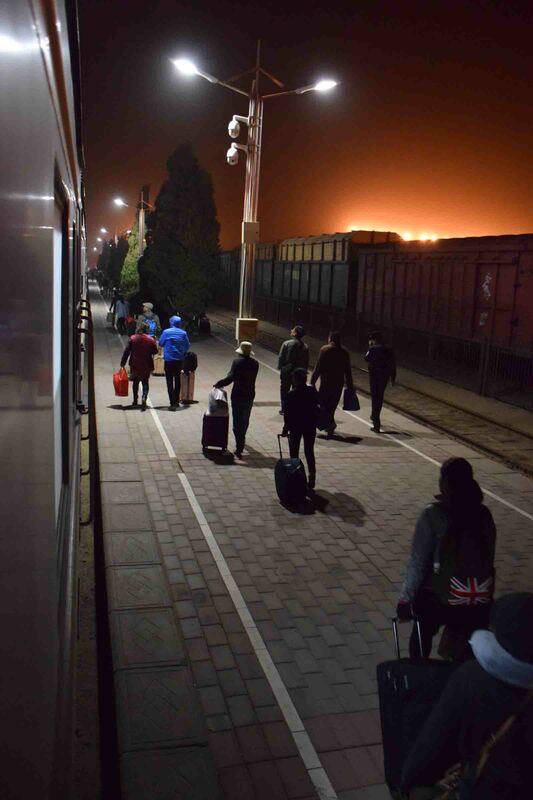 The entire border procedures were to take around FIVE hours. And that’s normal! 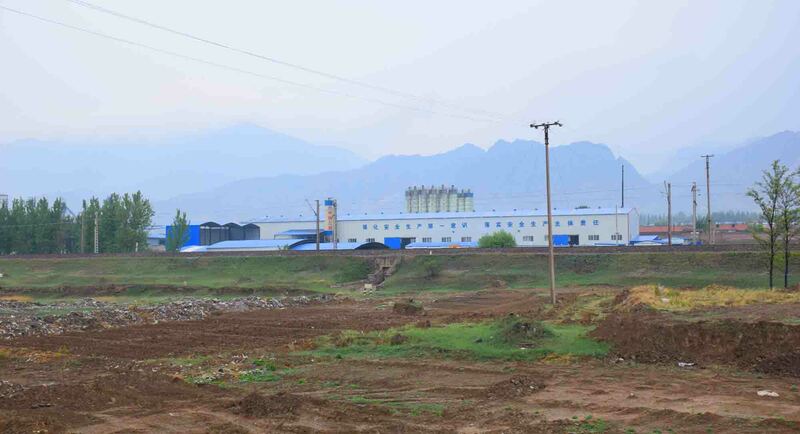 Arrival at Erlian, the Chinese border town. We pulled into Erlian and quite a few people disembarked there. Then I think our passports were taken. We waited. The train moved on with everyone still on board into this large shed. The train was split in two. The carriages were separated from each other and space out. 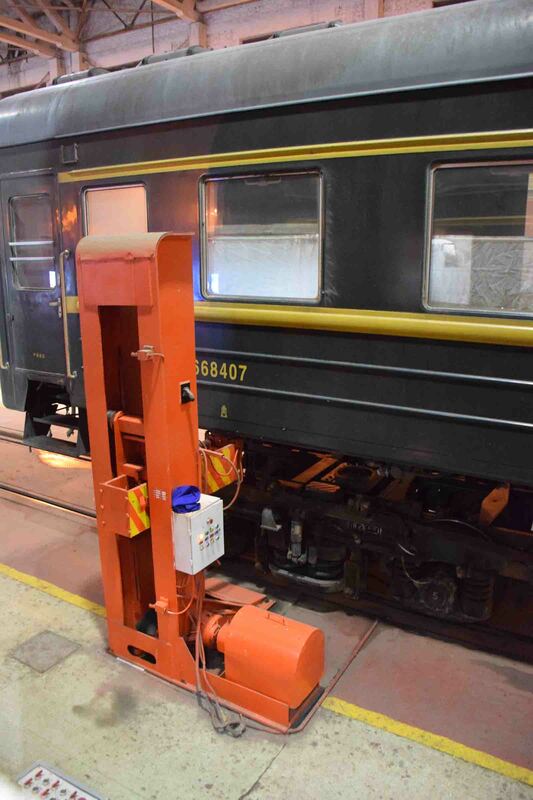 There were these hydraulic lifts on either side of the carriage (we watched through the windows) four per carriage. They locked on under the carriage after the bogeys had somehow been disconnected. The carriage was lifted up, probably to around 5-6 feet off the ground. The bogeys were pushed out and replaced by the new, slightly wider ones, and the carriages loaded. The bogeys were locked into place, attached to the carriage. I looked at the tracks, and really couldn’t work out what had happened. Had they been slightly widened? It didn’t seem so, but I think they had a system in place that worked for both gauges. Bang bang bang bang! All the carriages bumped together and then were connected. We moved on to the other side of the station where we stopped and got our passports back. 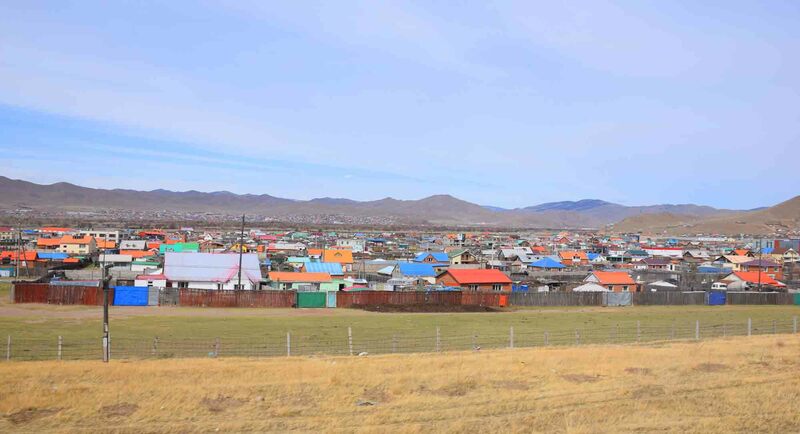 Then on to Mongolia! Stop. Passports taken. Wait. Snooze. Passports returned. I definitely fell asleep more than once in this period. We were due to move on by 240am but we were late even getting in to Erlian. I think we left around 330am, now in Mongolia. The sun rises, the train ride continues! I woke a few hours later needing the loo, and outside it was just incredible. Sand, sand sand! Yes we were in the midst of a desert! Sand whipped past the windows. It was such a contrast to the last sight of what was outside via daylight that I felt like I had arrived on another planet. I went back to sleep and woke a few hours later. Now the train was passing little villages. Trees were at a bare minimum. 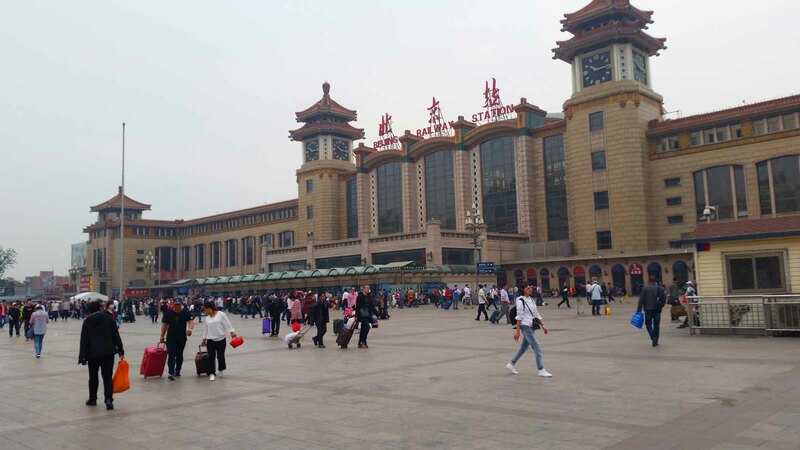 We had left Beijing in the high twenties, but now outside it was more like zero. 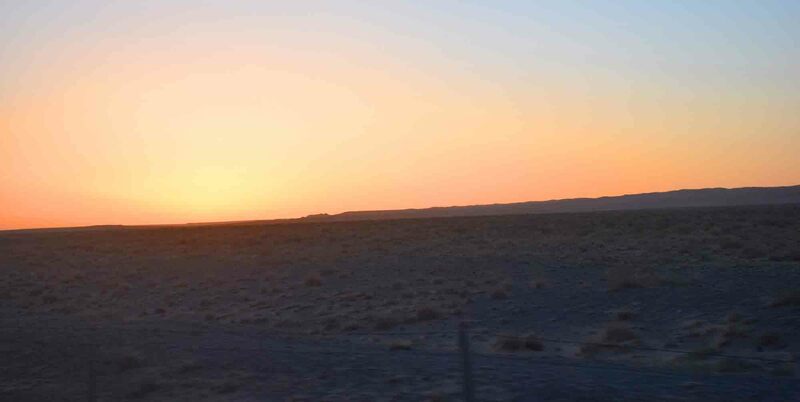 It was arid, steppe country. It was amazing! The restaurant car changed at the border, it was now somewhat ‘fancier’ and mostly gold and white. 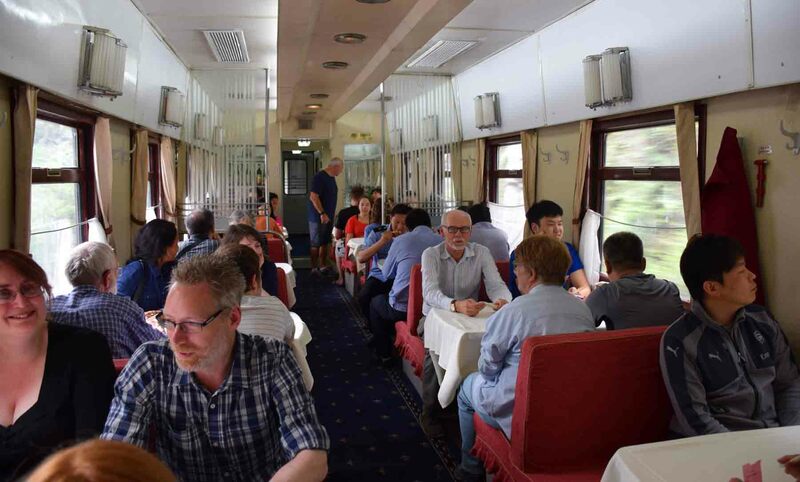 Each country has their own restaurant car – and so regardless of which train you are on at each border it changed. No more vouchers though, we had to pay for meals from now on. But we also had a choice and the Mongolian dumplings were a pretty decent sort of choice! 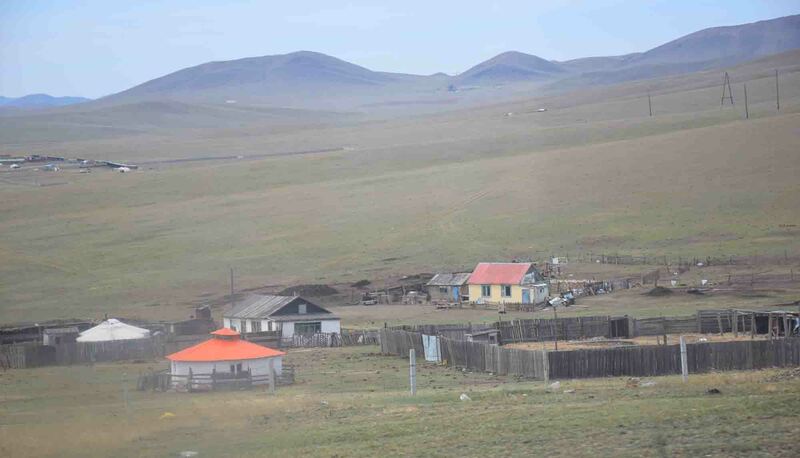 The scenery continued in a similar vein although the towns got bigger as we approached Ulan Bataar. Which clearly looked like a city as we entered it. We arrived there at around 320pm, about 40 minutes late which meant we’d actually made up a bit of time. 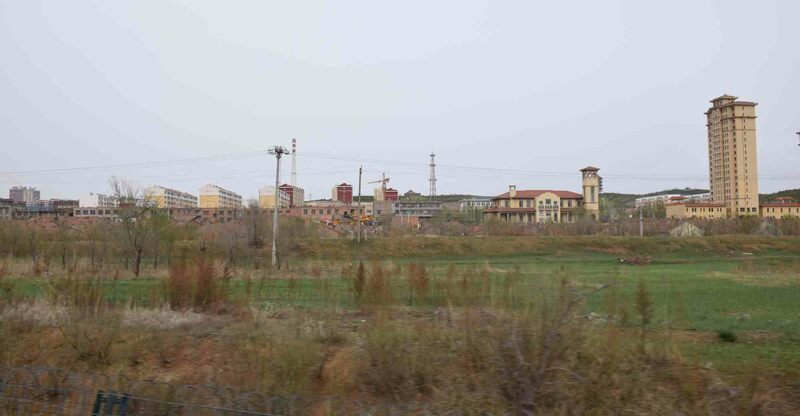 The train at a halt at Ulaan Baatar. It was freezing on the platform, I was met by a driver sent by my hostel. Here I was able to exchange money into the Mongolian currency before heading to the hostel. The first leg of my epic journey done with, 6,500 (ish) kilometres to go. Below is my video compiled of the trip, it’s around six minutes, do give it a look! Thanks for reading! May the Journey Never End! That trip is pretty incredible and that 2nd photo of the sand is just incredible. I just finished doing “El Chepe” in Northern Mexico from Chihuahua to Los Mochis and I have to say I have a new appreciation for the technical aspects of train travel. What you are describing about the gauges is quite something. lol well I just went to Itunes and searched for ‘Mongolian Music’. The gauge think is apparently a bone of contention for many as Russia and ex-Soviet states, plus Mongolia (which was sort of a defacto Soviet state) have this only slightly wider gauge to Europe and Asia. Of course, changing it with so many thousands of kilometres of track would be impossible. And it’s not all bad – you get to see this amazing process, from INSIDE the train! thanks for reading! 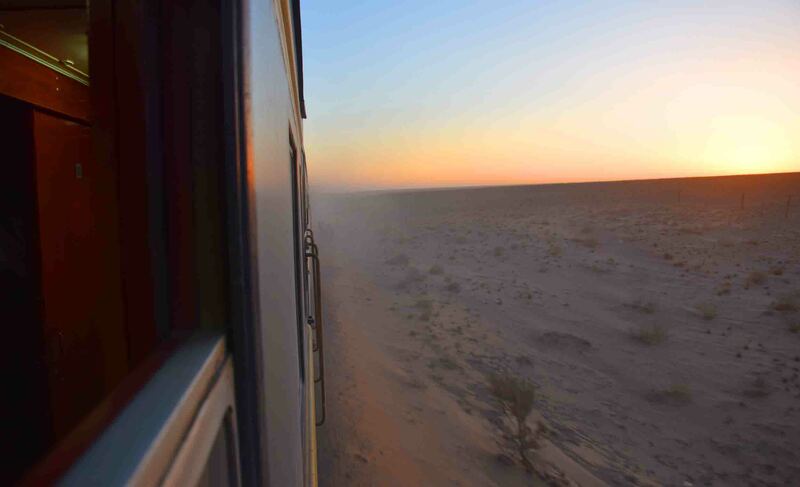 I’m afraid I would never sleep on such a journey – I would just feel I had to see every bit of the scenery! I would so love to take this train some day even though I’ve been to all three countries it passes through. Very cool! well the scenery is much harder to see at night! 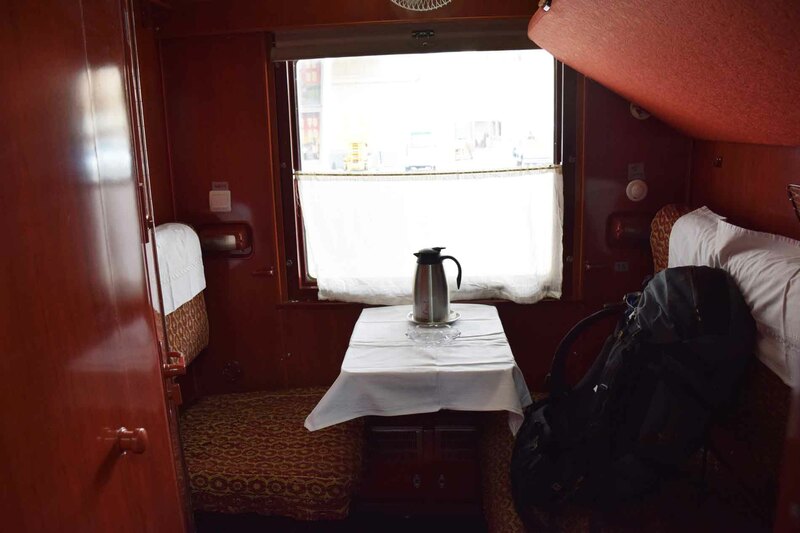 Actually although I’ve now taken the train, I still would like to do the Tran-Siberian as well (as opposed to the Trans-Mongolian) and possibly see what it was like if done in one hit! Thanks for reading! Great report and video. Fascinating!